Walking into Shanghai Disneyland provides a mix of familiar and novel elements. 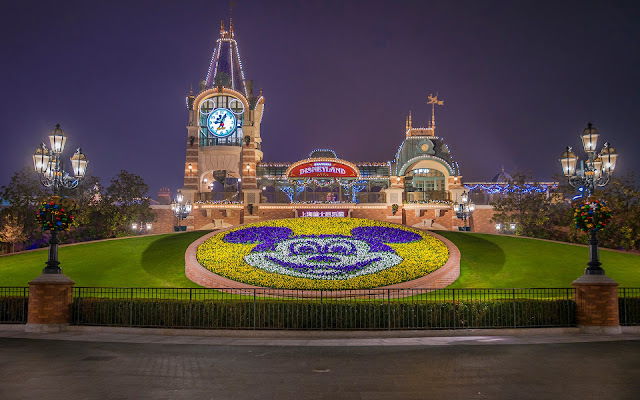 A Mickey Mouse floral pattern greets guests, just like at other Disney parks, but the train station-looking architecture in the background is actually nothing more than an embellished entryway into Mickey Avenue proper. Still, from a certain framing, the composition can look like something from Walt's original Magic Kingdom and not the sixth. And there's something nice about Mickey bidding one adieu at the end of the night, under the tranquil skies. Post-closing and double Mickeys at Shanghai Disneyland's entry area.